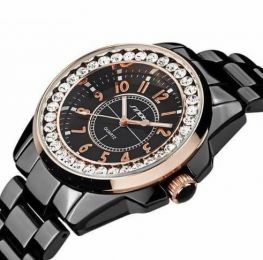 What a stunning watch to compliment your sophisticated look! Coming to you in a range of color options, this timepiece uses quality materials with striking coloring, incorporating a ring of bling around the outside of the dial. Our favorite is the rose gold and black, but feel free to check out the colors for yourself! SELLING FAST SO CLICK AD TO CART!